White sand with crystal clear waters. A great view looking across to Migo Island. There are toilet facilities BBQ’S and picnic tables next to the beach, you can swim fish or take a relaxed walk Make sure that you have your own drinking water. Warm summer water. Good parking and access to beach. Bibblmum track passes by. Quiet area & nice close by cafe. The Old Farm is located on Strawberry Hill in the suburb of Mira Mar in Albany, Western Australia. It is known as being the first farm in Western Australia. The hill on which the property is situated rises to a height of 237 feet (72 m) and is a spur of Mount Clarence. The soil is a mixture of clay and gravel with rich black loam on the lower side. The farm was initially established in 1827 for the first Government Resident in Albany, when the first Europeans settled at King George Sound Edmund Lockyer, Alexander Collie and John Lawrence Morley selected the site as a government farm. Originally it occupied an area of 1,536 acres (622 ha) but only 6 acres (2 ha) remain today. The next three commandants of the settlement, Captain Wakefield, Lieutenant Sleeman and Captain Collet Barker, followed Lockyer's plan of continuing to develop the farm. Alexander Collie was appointed Government Resident of Albany in 1831 and moved into a wattle and daub cottage situated on the farm. He named the property Strawberry Hill after the small plot of strawberries he was cultivating. Collie retired in 1832 and his successor was D. H. Macleod but it was the farm superintendent John Lawrence Morley who handed the property onto Richard Spencer. The old thatched roof wattle and daub part of the main residence burned down in 1870. A second cottage was built by Charles Miner in the same year. Francis Bird, the Chief Architect of Western Australia, acquired the property in 1889 and changed the name from Strawberry Hill to the Old Farm. His family retained ownership of the farm until the 1930s. The site lay derelict for many years until purchased by the Federal Government in 1956 and it was then vested in the National Trust of Australia in 1964. Conservation work commenced shortly afterwards and it was later opened to the public. Open Monday to Friday from 10:00 AM – 4:00 PM, CLOSED LAST TWO WEEKS OF JULY AND ALL OF AUGUST. CLOSED CHRISTMAS DAY, BOXING DAY, NEW YEAR DAY & GOOD FRIDAY. Mistaken Island is an island located approximately 5 kilometres south-east of Albany, Western Australia. Located in King George Sound the island is located approximately 120 metres from Vancouver peninsula. In 1971, the island was declared as a class 1A Nature Reserve with a total area of 12 hectares The area adjacent to the island is used to cultivate mussels on long lines. The island received its name for the fact little penguin burrows were mistaken for rabbit holes and the island has also been historically referred to as Rabbit Island. If you come at the right time of the year you might even see fairy penguins nesting in and around the Island. Please take care not to disturb them. Frenchman Bay is one of the few places in the world where you can relax on a white sandy beach, swim, snorkel, enjoy spectacular ocean views and witness the breathtaking sight of the annual whale migration. FRENCHMAN BAY is located 20 kms drive south of Albany, on a spectacular area of coastline adjacent to the magnificent Torndirrup National Park, The Gap, Natural Bridge and The Historic Whaling Station, and is perfect for families, weddings and those not able to walk very far. View of the south coast of Western Australia, from the Bibbulmun Track, between Denmark and Peaceful Bay. The Bibbulmun Track is a long distance walk trail in Western Australia. It runs from Kalamunda, east of Perth to Albany and is 1,003.1 kilometres (623.3 mi) long. The name comes from the Bibbulmun, or Noongar people, Indigenous Australians from the Perth area. The track consists of 58 sections and is marked at regular intervals with triangular pointers, most of which have an image of the wagyl, a mythical creature from Aboriginal Dreamtime stories. Each section is approximately one day's walk, except for the northernmost 150 km or so, where the sections consist of half-day walks. At the end of each section is either a town or a purpose-built campsite. Each campsite consists of a three-sided shelter with wooden sleeping platforms, a water tank, a pit toilet, picnic tables and cleared tent sites. In the northern half, most campsites also have a barbecue pit and plate (open fires are banned in the southern section). The Track is almost all through state forest, national parks and other reserves, with only a few small sections of farmland. The first half of the Track is through the Jarrah forests of the Darling Range. It then moves through flatter tall Karriforests until reaching the coastline near the town of Walpole. The remainder of the Track is through coastal forest and scrub along the south coast, in some sections routed along sandy beaches. The towns the Track passes through are Dwellingup, Collie, Balingup, Pemberton, Northcliffe, Walpole and Denmark. View of the south coast of Western Australia from the Bibbulmun Track, between Denmark and Peaceful bay. Wildflower displays, birdlife and other Southwest Australian flora and fauna. The Bibbulmun Track is managed by the Western Australian Department of Parks and Wildlife (DPaW) and The Bibbulmun Track Foundation – an incorporated not-for-profit community-based organisation established to provide support for the DEC in the management, maintenance and marketing of the track to ensure that it remains a "long distance walk trail of international significance and quality". The foundation sells maps and guide books, offers trip planning advice, offers equipment hire and runs courses on camp cooking and navigation. Most people choose to walk sections of the Track for one or a few days at a time. Hardy walkers who walk the Track from beginning to end typically do so in 6 to 8 weeks. The most popular time to walk the Track is during the wildflower season of spring ( September – November), going from north to south as the wildflower season starts later in the southern areas. In summer the weather can be very hot and water will be hard to find except in the water tanks at the campsites. Winter can be wet, especially in the southern areas but people walk the Track any time from March to December. The "Valley of the Giants" is one of the main tourist draws in the area. Those with a head for heights can get a tree top view on the "Tree Top Walk" a 40 m high walk-way that can accommodate wheelchairs. Most similar canopy walks around the world are constructed using suspension bridge-type structures — not for the faint of heart. The Tree Top Walk, however, is a series of sixty-metre, lightweight steel trusses built on steel pylons to form a secure ramp. Beneath the canopy walk there is a pathway around the Tingle trees for walkers — this is known as the "Ancient Empire". A whale watching vantage point is settled at Conspicuous Beach, providing views of migrating whales (humpback and southern right) and dolphins. he Tingle tree has evolved to cope with bush fires and can withstand low level fires. The Department of Parks and Wildlife carries out fuel reduction backburning in the national park; this limits the risk of a large scale bush fire by reducing the amount of dry leaf litter on the ground. Tingles can look completely burned in the inside but continue to survive as they grow from just under the layer of outside bark. The park also extends to the coast, providing a range of habitats from forest to coastal heathland featuring swamp paperbark and a red flowering gum which is endemic to the region. Conspicuous Cliff is one of the few places the coast is accessible in the National Park. The area also the Walpole-Nornalup Inlets, which are fed by the Deep and Frankland Rivers. The Bibbulmun Track winds through the park to the coast. Walpole lies very close to the northern point of the 100-hectare (250-acre) Walpole Inlet, from which it takes its name. The inlet in turn is named for the Walpole River, discovered in 1831 by Captain Thomas Bannister, and named by Governor Stirling for Captain W. Walpole, with whom he had served aboard HMS Warspite in 1808. The first European settlers to arrive in the area were Pierre Bellanger and his family in 1909. They travelled aboard the Grace Darling from Albany to take up 4,000 acres (16 km2) of land. Land in the Walpole area was reserved for a national park in 1910, and the area subsequently became a popular holiday destination. Major development began to occur in the 1930s as part of the land settlement scheme. The railway reached Nornalup in 1929, and the Walpole town site was gazetted in 1933. Walpole was always the preferred name, but it was believed this was already in use in Tasmania. So the newly gazetted township was officially named Nornalup, but this caused confusion with the railway terminus 13 kilometres (8 mi) east. Eventually the Post Office advised that there was no Walpole in Tasmania, and in 1934 the town reverted to its original name of Walpole. Walpole is one of the few towns through which the Bibbulmun Track passes. The area is famous for the giant tingle and karri trees of old growth forest. Another attraction is the Valley of the Giants Tree Top Walk in the Walpole-Nornalup National Park. Nyabing in the Shire of Kent is a small town in the Amazing South Coast region of Western Australia. The name is of Aboriginal origin and is thought to derive from the Aboriginal word "ne-yameng" which is the name of an everlasting flower Rhodanthe manglesii. The first Europeans to visit the area were sandalwood cutters and the first lease taken in the area was by settler John Hassell in 1873. The townsite was planned in 1911 as part of the Great Southern Railway the name given to the siding was Nampup. The name Nampup is also Aboriginal in origin and is the name of a local soak. Lots were surveyed later in the year and the town was gazetted in 1912. The name was changed later that year after several complaints that Nampup was too similar to Nannup so the town was renamed to Nyabing. Nyabing Inn - Nyabing Inn is open 7 days a week. Call in to this typical country pub for a chat with the locals and a cold drink or two. About 4 km out of Nyabing, on the road to Katanning, you will see clearly an enormous eagle's nest, out on the swamp flats. Eagles mate for life and return to the same nest year after year, unless disturbed. So far, this one hasn't been disturbed. If you like to spot and identify birds and other animals, Nyabing will give you many opportunities to indulge this interest. A walk through the nature reserve at Nyabing Creek puts you in the midst of all kinds of wildlife and lots of sandalwood trees. The wildflowers in spring are truly spectacular. There is lots to see and do in this tiny little town. Situated at the Memorial Park in Nyabing, this area is dedicated to the men and women who served our country. The annual ANZAC Day commemoration is held here each year on 25 April, with a march starting at the Town Hall and arriving at the park for the service. In 1893, John Holland travelled to the Goldfields and this track marks his route. The track can be followed all the way to Coolgardie. Nyabing Creek Nature Reserve showcases spring wildflowers and can be seen on a walk through the nature reserve, You’ll also find sandalwood trees, a resource which brought our original settlers to the area as cutters. Located on Richmond Street, Nyabing the Settlers Hall was built to be used as a school and was officially opened in 1915. It has been moved from its original position on Martin St, where you’ll see a memorial stone, to its present setting. Over the years, the building served as a hall, the Kent Roads Board, school and a church. Many a wildlife has been seen here including western grey kangaroo, western brush wallaby, echidna, blue tongue lizard and a huge variety of birdlife. The log in the main street car park is all that remains of a historic salmon gum, You can see the enormous base of the trunk in the garden near the loggia. Lasting for over 100 years, it finally succumbed in 2009 and was lopped on advise from an aborist. The Brownie Hut, as it is known locally is also a school site, Built in 1924, it has been used as a school and a youth facility. On the outskirts of Nyabing and marked by a large granite rock that was placed on site as a memorial for this historical site which was used by explorers. Located in Pingrup, the Federation Shed contains relics from the history of the Shire of Kent and some local artwork. The pink lakes are situated along the floor of a broad shallow valley that runs in a north-south direction between Nyabing and Pingrup. Over half the area is covered by bare salt lakes with no vegetation. The reason they are pink is due to a microscopic salt-loving bacteria called Halo Bacteris that produces red pigment. The Shearer’s Monument is significant in its association with one of the main industries of the shire and its proximity to the gran bulk handling grain bin and railway station site. The replica stands on top of what the locals call the “shears shed”. The Pingrup community in conjunction with the Shire of Kent and the Pingrup Lions Club converted the shed into a shearing complex, competitions were held here every year up until 2001. Located 40kms northeast of Pingrup, early aboriginals are believed to have sued his area as a passing and watering hole. John Holland is believed to have discovered them during his journey to the goldfields in 1893 along Holland’s Track. Situated 35km northeast of Pingrup, Lake Bryde is an ephemeral wetland that is part of a chain of lakes. Historically Lake Bryde was used as a water source during times of drought. Twenty-nine Australian land mammals have become extinct over the last 200 years, and 56 are currently facing extinction. These losses and potential losses represent over a third of the 315 species present at the time of European settlement. We recently published the first review of all Australian mammals, finding that Australia has the worst rate of mammal extinctions in the world, and the situation isn’t improving thanks to feral predators such as cats. In response, Environment Minister Greg Hunt has proposed investing in research for a cat-killing disease as a form of biological control. But while biological control will be part of the solution, it is not the silver bullet. The real solution will have to involve a change of heart. Most Australians know of and regret the extinction of the thylacine — but few recognise that this one extinction is symptomatic of a much more pervasive loss. Twenty-eight other mammals have become extinct since 1788, and we suspect that few would know their names, let alone of their loss. It’s still happening. In 2009 the Christmas Island Pipistrelle (a tiny bat) became extinct, and the Bramble Cay Melomys may have suffered a similar fate recently, thanks to neglect. These species are or were not obscure marginalia or predestined for oblivion. Instead many were common and played important and irreplaceable roles in our country’s ecology. These species were part of the fabric of this land. The Australian mammal fauna is the most distinctive in the world: 86% of our 315 land mammal species are found nowhere else. Since the 1840s we’ve lost mammals at the rate of one species per decade. On current trends, there will be many more extinctions of Australian mammals in the next one or two generations: we found 56 land mammal species (more than 20% of our land mammals) are now threatened with extinction. Out to sea the situation is a little less bleak, but more opaque. Of 58 species reported from Australian waters, six are threatened but 35 are considered Data Deficient – they may or may not be in trouble, but we don’t have enough information to be sure. It may sound all doom and gloom — and in many respects it is — but it’s important to note that conservation can work. Both Gilbert’s potoroo and the Bridled nailtail wallaby have been brought back from the brink through dedicated effort. So how do we go about saving the rest of Australia’s threatened mammals? Some consider this an economic question — with X amount of dollars, we can save X number of species, but which ones? This is the argument of medical triage, a sharp prioritisation that directs funds only at the most savable and valuable species. But this is a defeatist mentality. To advocate for species’ extinctions by choice or through disinclination is unconscionable. Triage was born on the battlefields of Napoleonic Europe, where life and death choices had to be made in minutes. It is an inappropriate analogy for biodiversity conservation. A better analogy is with the education system. Our society accepts the obligation that all children should be schooled, and recognises the benefit to society from that premise. So too with conservation: we should recognise the obligation to attempt to safeguard all species. In a nation as affluent as ours, this can and should be a realistic objective. But to do so we have to target our resources at the right problems. Cats are the greatest threat to Australia’s mammals. Like many other threats, they are now a pervasive and deeply-entrenched problem, and we recognise that it will not be solved simply or quickly. There are some measure we can implement immediately: translocating threatened species, establishing a network of cat-proof enclosures, and better management of dingoes and wild dogs (which can help control cat populations). But we also need to look at long-term solutions. This has formidable challenges. Current trials in cat-baiting are promising, but we don’t yet know if they will work on a large scale. Biological control (such as a disease) may take decades to develop, and has to overcome concerns from cat owners, and risks to other Australian wildlife and cat species overseas. Even so, controlling cats is likely to do more for the conservation of Australia’s biodiversity than any other single action. But we have concluded that we will not solve the mammal extinction crisis simply by repeating the same actions over and over. The problem is far more fundamental. Conservation is not just an environmental problem; it also charts a moral landscape. How does our society fit into this land? What do we consider is important? Is it reasonable that we gift our descendants only a faint shadow of our country’s extraordinary nature? We have worked extensively in remote Australia. We have shown old Aboriginal men and women stuffed museum specimens of now-vanished mammals, and been struck to our core by their responses: singing the song of that animal, stroking it, telling its story, crying at its loss. Here is an affinity to nature, a deep connection to our land, an ache of responsibility, that we settler Australians have not yet felt or learned. To become part of this country, to care for it properly, we need to grow some of that sense of belonging and affinity. Otherwise, extinctions will continue to be viewed as inconsequential. Our review of the fate of Australian mammals reflects uncomfortably on our society. Without understanding of our country, without linkages to, and affinity to, its nature, and without a corresponding commitment to its well-being, our society will fit poorly in this land and these seas, and we will continue to erode the most remarkable fauna in the world. We must accept that biodiversity conservation is not only an obligation of government, but a shared societal responsibility. This article was co-written by Dr Andrew Burbidge, who is a co-author of the action plan. He is a Research Fellow with the WA Department of Parks and Wildlife. When it comes to mammal extinctions, Australia’s track record over the last 200 years has been abysmal. Since European settlement, nearly half of the world’s mammalian extinctions have occurred in Australia – 19 at last count. So, when faced with the additional threat of climate change, how do we turn this around and ensure the trend doesn’t continue? Learning from previous extinctions is a good place to start. A comparison between two Australian species, the recently extinct Christmas Island pipistrelle and the critically endangered but surviving orange-bellied parrot, provides some insight into the answer to this question. Namely, that acting quickly and decisively in response to evidence of rapid population decline is a key factor in determining the fate of endangered species. Endemic to Christmas Island, the pipistrelle was a tiny (3.5 gram) insect-eating bat. It was first described in 1900, when numbers were widespread and abundant. In the early 1990s this began to change. The decline was rapid and the exact cause uncertain. By 2006, experts were calling for a captive breeding program to be initiated. These pleas were ignored until 2009 when it was finally given the green light. Sadly the decision came too late, and two months later the Federal Minister of Environment announced that the rescue attempt had failed. Concern about the orange-bellied parrot began in 1917, but it wasn’t until 1981 that it was confirmed to be on the brink of extinction. In an attempt to save the parrot, a multi-agency, multi-government recovery team was set up and a captive breeding program began in 1983. Like the bat, threats to the parrot remain poorly understood. In 2010, monitoring showed that the species would become extinct in the wild within three to five years unless drastic action was taken. The recovery team immediately took action to bolster the captive population as insurance against extinction. There are currently 178 birds in captivity and less than 20 in the wild. What do these two tales tell us about how me might avoid future Australian extinctions? It seems that one of the main differences, and perhaps the difference over which we have the most control, were the decision-making processes involved. How we manage endangered species ultimately comes back to the decisions made, including who makes the decisions, who is held accountable, and the timing of these decisions. Examining these cases in the context of decision-making reveals some clear differences and highlights some important recommendations for the future management of endangered species. One of the key differences was in the governance and leadership surrounding the two cases. Experts involved in monitoring the pipistrelle provided recommendations to government bodies, but did not have the authority to make decisions nor was there an effective leader to champion the urgent need to act. Conversely, the Orange-bellied Parrot Recovery Team had the authority to make decisions and act on them. Indeed, thanks to the Recovery Team’s broad representation, any failure to act would likely have resulted in public outcry – which raises the issue of accountability. Management of endangered species requires tough decisions, yet they are decisions we must make. If we monitor declining populations without a process for deciding between different management options, we will only document extinctions. In some cases, the logical decision may be to employ a triage system where priority is given to species with a high likelihood of recovery. Assigning institutional accountability around the management of endangered species could help to ensure that tough decisions are made and that the processes involved are transparent. Finally, the cases of the bat and the parrot also highlight the need to act quickly when a species is found to be on the brink of extinction. Delaying decisions only narrows our choices and removes opportunities to act. We may not always have all the answers, but this cannot be used as a reason to delay decision making. Based on a triage system a decision to not to act might be the best way forward, but if we delay the decision it becomes the only way forward. It is all well and good to say that we need leaders to be accountable and make timely decisions; but in a world where insufficient conservation resources exist to manage all endangered species, how do we ensure that the decisions we make are the right ones? This is where science can help. Scientific analysis can be used to determine how much information we need to inform a good conservation decision. In the case of the Christmas Island pipistrelle, the decision to start a captive breeding program came many years too late. By evaluating the costs, benefits, and feasibility of taking different management actions in the light of what we know about a species’ decline (or don’t know - i.e. the degree of uncertainty), it is possible to get the timing right. Research into the methods used to stem species decline is also underway. For example, captive breeding and reintroduction programs are generally regarded as having good success rates. Further investigation into genetic management, habitat restoration, and effective techniques for reintroduction and risk management will help ensure the success of these programs for a variety of species. Stemming the global loss of biodiversity through recovery planning will require brave decision-making in the face of uncertainty. Monitoring must be linked to decisions, institutions must be accountable for these decisions and decisions to act must be made before critical opportunities, and species, are lost forever. Particular thanks go to Mark Holdsworth, Stephen Harris, Fiona Henderson, Mark Lonsdale, and my co-authors on the original paper on which this article is based. Should your next holiday include a safari, whale watching, or a trip to a tiger temple? Ecotourism has recently been in the spotlight. For instance, we’ve seen claims that tourism helps conserve tigers and that it has been linked to wildlife trafficking. But how can we tell if ecotourism is good or bad for threatened species? In our research published today in PLOS ONE we looked at nine different species, and found that overall, ecotourism is good for wildlife. Great green macaw in Costa Rica, Egyptian vultures in Spain, hoolock gibbons in India, African penguins, African wild dogs, cheetahs, and golden lion tamarins in Brazil all benefited from tourism. But we also found that current tourism levels aren’t enough to help orang utans in Sumatra, and are actually bad for sea lions in New Zealand. So how do we get the balance right? “Ecotourism” is a very broad term. It may include visitors to public national parks, volunteers for community projects, or adventurous expeditions to remote regions. Some may even include hunting safaris. Ecotourism has both positive and negative effects. It can contribute to conservation, or impact wildlife, or both. Some effects are small, others large; some direct, others indirect. Attitudes of local communities towards native wildlife, for example, influence whether they support or oppose poaching. Furthermore, income from ecotourism may be used for conservation and local community development projects, but not always. We also need some way to measure ecotourism effects on wildlife? Many ecotourism measures are social or economic rather than ecological. It’s often difficult to compare positive and negative impacts on a species. Therefore, quantifying the net effect of ecotourism is challenging. For species at risk of extinction, such as those in the International Union for the Conservation of Nature Red List, it is critical to be able to assess how various threats, including tourism, affect their survival. So we wanted to develop a way of measuring how ecotourism affects the risk of extinction for these species. Previously when considering ecotourism researchers looked at revenue to parks, and how much of a species’ global population was protected by these parks. This approach showed that tourism funding is significant for many IUCN Redlisted mammals, birds and amphibians. But it doesn’t tell us whether ecotourism will help or harm a specific species or population. Our new approach uses population analysis (specifically population viability analysis). This sort of analysis is the gold standard for predicting future population trends, and probable time to extinction, for threatened species. We looked at how populations changed over time in response to threatening processes, by simulating births and deaths one generation at a time. We do this thousands of times to estimate extinction risk. These methods are well-tested and widely-used in practical wildlife management. To do this we need to know a couple of things about the species we are looking at: habitat area; population size and age. We also need to know the birth and death rates for different ages as well as migration patterns. This information exists only for some threatened species such as those used in our study. We also need to be able to convert ecotourism effects into these measures of species performance. By looking at how ecotourism affects these aspects we can compare ecotourism to other threats such as poaching, logging, or fishing. For seven of the species that we looked at, ecotourism provides net conservation gains. This is achieved through establishing private conservation reserves, restoring habitat or by reducing habitat damage. Removing feral predators, increasing anti-poaching patrols, captive breeding and supplementary feeding also helps. But for orang utans in Sumatra, small-scale ecotourism cannot overcome the negative impacts of logging. However, larger-scale ecotourism yields a net positive outcome by enabling habitat protection and reintroduction of individuals from captive situations. Unfortunately for New Zealand’s sea lions, ecotourism only compounds the impacts of intensive fisheries, because it increases the number of sea lion pups dying as a result of direct disturbance at haul out sites. Our research highlights three key messages. The first is that to predict how ecotourism affects wildlife, we need to know basic things about them: ecotourism needs biologists as well as social scientists. The second is that the effects of ecotourism are not universal: whether ecotourism is good or bad depends on the species and local circumstances. The third, and perhaps most important, is that ecotourism, at appropriate levels, can indeed help to save threatened species from extinction. One of Western Australia’s iconic beaches, Greens Pool is a must see destination and just a 40 minute drive from HideAway Haven. Spend the day in Denmark, there is so much to experience and discover. Greens Pool lies on the edge of William Bay National Park and is famous for its turquoise green waters and pristine white sandy beach. Large granite boulders surround the pool, protecting it from the might of the Southern Ocean. Beautiful at all times of the year, Greens Pool is especially popular in summer. The calm waters provide great recreation opportunities for the whole family. You can swim or snorkel or just relax on the beach or on the rocks overlooking the water. Many fish and sea creatures live in the calm waters of Greens Pool. Why not go for a snorkel and explore this fascinating seascape? Zebra fish, silver drummer, six-spined leatherjackets and mosaic sea stars are just some of the creatures you may encounter. The beach is white sand and has stairway access at the western end where Taylor Inlet discharges into the ocean. Toilets, a picnic area and a caravan park are also situated at the western end of the beach. Four-wheel drive vehicles are permitted on the beach and can drive as far as Two Peoples Bay. The beach is not patrolled by surf lifesavers and can be dangerous due to the presence of many rips along the beach. A man drowned at Nanarup in 2013 after being swept off the rocks while fishing. The area is popular for surfing, fishing and swimming. Approximately 4.2 kilometres in length, Nanarup has scattered beachrock reefs at the eastern end for a distance of about 1.0 kilometre then curves to the southwest; the remaining length is a wave dominated surf zone that extends as far as the inlet. The beach is mostly backed by scarped 12 m calcarenite bluffs to the east and unstable dunes to the west. The far western end of the beach has the 20 metres granite boulders of Islet point connected to the shore by a small tombolo forming a sheltered pool. Point Possession Trail, is 6 km walk from the old Quarantine Station at Quaranup to Point Possession where George Vancouver claimed the whole of Western Australia for Great Britain. The Quaranup / Point Possession Trail, a 6 km walk from Albany's old Quarantine Station to Point Possession. This is an easy 6km hike. Point Possession is a long, narrow isthmus with a beach on either side, leading to a low, rounded granite hill at the end. It's a scenic spot with Views of King George Sound, the shipping channel, Princess Royal Harbour and Albany Port. Quaranup, also known a Camp Quaranup and Albany Quarantine Station, was once a quarantine station in Albany, Western Australia; it now operates as a camp for tourists. Situated in a Class A nature reserve on the Vancouver Peninsula on the shoreline of Princess Royal Harbour opposite the Port of Albany, the camp has panoramic views of Albany. The complex consists of 17 separate stone and timber framed structures in varying architectural styles. The necessity of a quarantine station arose after a number of incidences involving sickness aboard ships arriving in Albany lead to demands for a quarantine station to be built close to the port. These included an illness on the Bombay in 1865, suspected smallpox on the Rangatira in 1872 and a sick passenger aboard the Baroda the following year. No plans were made until a group of dignitaries including the Colonial Secretary, Frederick Barlee, were quarantined in tents during inclement weather on barren Mistaken Island for a period of two weeks. The irate officials then took an interest in having a permanent quarantine station close to the port. Tenders were called for and the facility was established in 1875. Initially the centre consisted of only a caretaker's cottage and jetty costing £530. A powder magazine was built on Geake island, the windowless stone building with an iron door used to store ammunition was completed in 1878. Further additions to the complex were completed in 1897, including the doctor's and servant's quarters, isolation ward, mortuary, laundry, wash house, general store, and first class quarters. A fumigation bath house and a jetty were built in 1903. The station was used to deal with various epidemics and diseases until 1930 with a final outbreak of influenza, after this the facility was virtually closed. During World War II the facility operated as a submarine base. American servicemen were also billeted there for rest and recuperation in 1942. The station was decommissioned in 1956. The Wheeler family then privately leased the station later the same year and the name was changed to Camp Quaranup. The Wheelers operated the camp until 1970. The site was then vested in the Shire of Albany who subsequently leased the camp to the Albany Youth Committee in 1971. The station was classified by the National Trust in 1977. The complex was deemed significant for its architectural character and its historic foundation. A lookout was built at the highest point on the peninsula known as Quarantine Hill by the camp managers in 1997. Surrounding points of interest that can be seen form the lookout include; Cheyne Beach Whaling Station, Torndirrup National Park, Princess Royal Harbour, King George Sound, Goode Beach, Little Grove and Big Grove. The camp was closed for late 2005 and early 2006 and reopened by Premier Alan Carpenter in April 2006 after a A$1.1 million renovation. The kitchen was refurbished, toilet blocks upgraded, new water storage and filtration equipment installed and asbestos removed from the site. 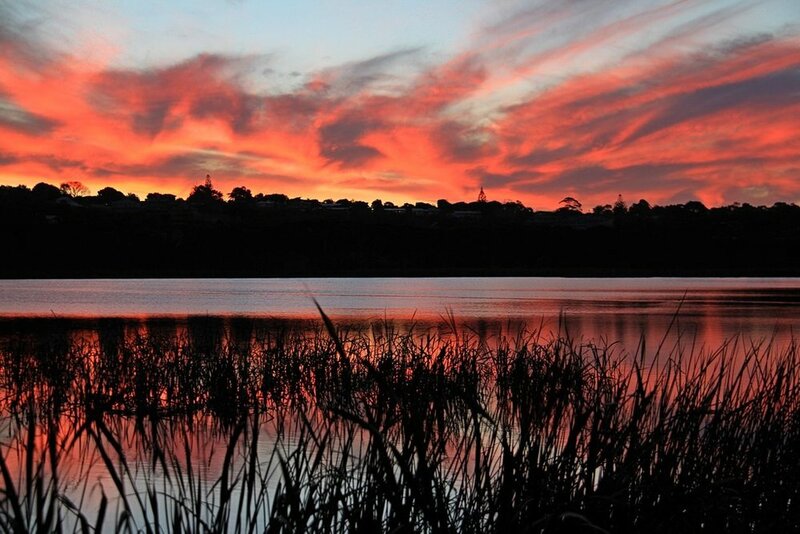 Lake Seppings is a freshwater lake located within the Albany Region. The lake is nearly completely surrounded by a 2.7 kilometres (1.7 mi) compacted gravel footpath and wooden walkways. A wooden bird watching platform has been built along the western side of the lake. A car park for access to the path is located along Golf Links Road. Lake Seppings has a rich variety of vegetation and is surrounded by a mixture of bullrushes, and reeds. The trees are a mixture of Myrtaceae: Western Australian Peppermint trees, Spearwoods, Paperbarks, Native Willows and Wattles. Banksias are also found around the lake. The local indigenous Australians are the Noongar People whose name for the lake is Tjuirtgellong which means "The place of the long-necked tortoise".